The final installment to my Halloween 2014 nail art series is somewhat personal ... again. As you have read in my previous posts, I am a recent furparent to a sweet cat named Floozie and her 4 adorable furbabies. 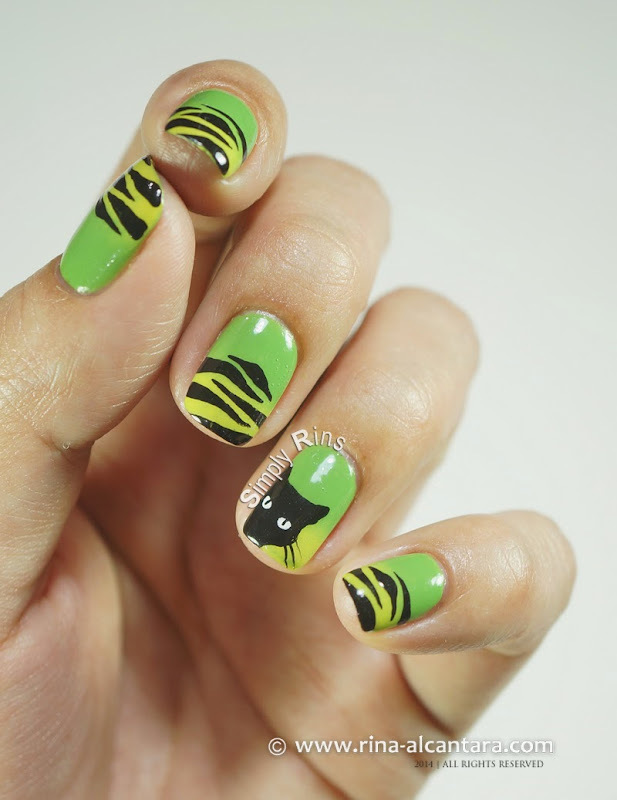 So yes, this is another cat inspired Halloween nail art design. But this time, I would like to advocate the safety of cats, particularly black cats during this season of superstitious beliefs. We all know that black cats is associated with bad luck and during Halloween there are (heartless) people who find it amusing to hunt and hurt cats. 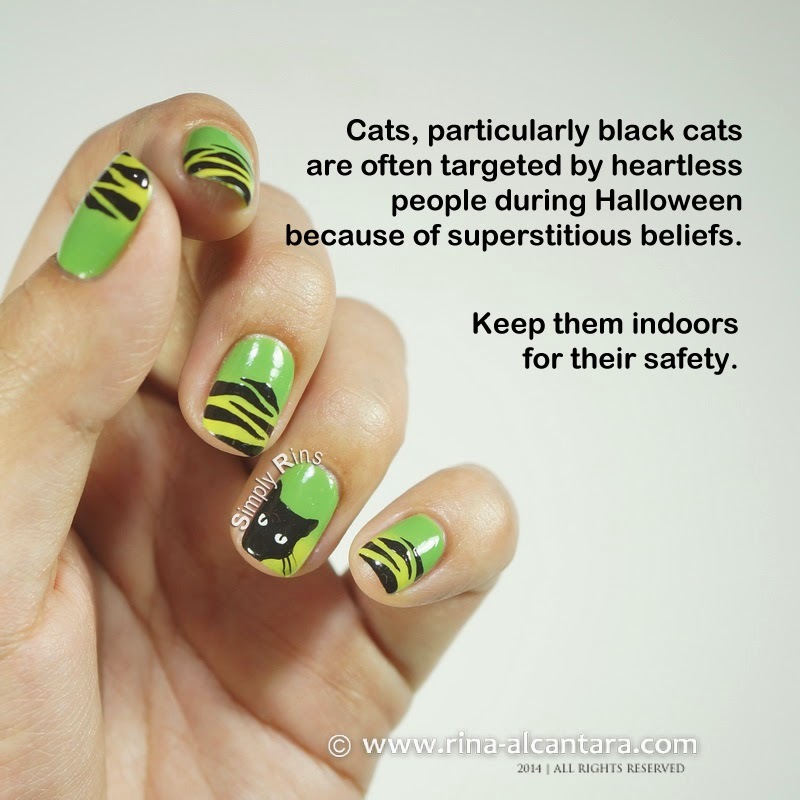 Experiencing first hand how wonderful cats are, I would like to contribute to the campaign through this nail art post and hopefully help spread the word to help safeguard cats during this superstitious time by keeping them indoors or simply by spreading the word. They advocate spaying/neutering of cats to control the ever growing population of street cats here in the country. Almost everyday, a post is made by members on their page of abandoned kittens, wandering cats, and those badly injured. I know it is may sound cheesy but it breaks my heart every time I read them. This group has been rescuing and adopting cats, some even has more than 10 and it amazes me. I know how big the responsibility of taking care of 1 cat. What more for 10 or more felines? However, we cannot take all the cats off the street. But we can help with the problem by being responsible cat owners. This is the reason why Floozie is scheduled for spaying when her kittens are fully weaned. And her litter is scheduled as well when they reach 5 months of age. I really wanted to do a different design for my Halloween nails. But I can't resist not doing another black cat nail art to send my message across. But this time, I only painted one black cat as an accent nail and drew some scratches on the rest of the nails. For base, I wore a gradient manicure using OPI Greenwich Village and OPI Do It On Em. I used the latter on my nail tips to make the scratches pop up better. Initially, I wanted to use an orange and yellow combo for a more traditional look. But a friend suggested to use green as background for a Halloween design and I figured it might be give this a good twist. I'm not complaining. I really love how this manicure turned out. It made the nail art a subtle Halloween look. The design was painted freehand using acrylic paint and a detail nail art brush. I painted a peeping black cat as accent nail and decided to just paint the head. I wanted it to look more realistic. Sadly, I am not that kind of artist. But I am very satisfied with the results. I also wanted to paint a cat on each nail, but went against it because I thought it might be overwhelming? Do you think so, too? So, what are you wearing for Halloween this year? Have you decided? 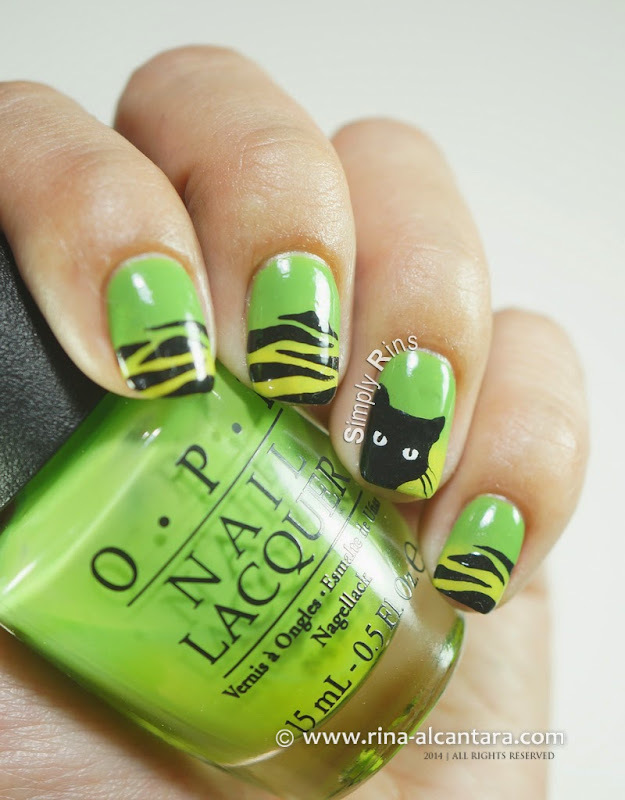 Perhaps a black cat inspired nail art design as well? I have done a few more that you can view at my Halloween Nail Art Gallery. Also, I did a little something (the photo below) that you can share with your friends if you decide to spread the word of keeping cats safe on Halloween. Thanks! Wow these are perfect.. loved them..
Btw, I have a query about your picture uploading.. do you upload them on your blogger directly or you yse any image hosting site to upload them? Which one do you suggest is a better option? Also can you share your photo editing techniques..?? I use Picasa to upload my photos so I can arrange them by album. To me, this is better than uploading directly on blogger since you can better manage your photos.